I came out to this one because a friend I haven't seen in years was competing in it. Now, I shoot in night clubs a lot, and I've shot performance dance before, so I thought I would know what to expect. This was totally different though. People communicated to eachother through the power of dance. Everyone was a bboy (bgirl? ), and they were all dancers. I was pretty much the only spectator, an outsider entering their world to document the unfolding events. Seriously, it was weird. No rules (that I could understand anyhow), people got right up to the dancers, forming a circle. Now, I've seen this when I went to some clubs and parties where they had breakdance performers, but I thought that was just because it gets pretty cramped at a club. No, this was a big gym with plenty of space. It's just how things are. Apparently this was for something called the IBE Qualifier. Some sort of international breakdance competition, and the top 8 bboys in Canada will go to Holland for a convention called "Notorious IBE". 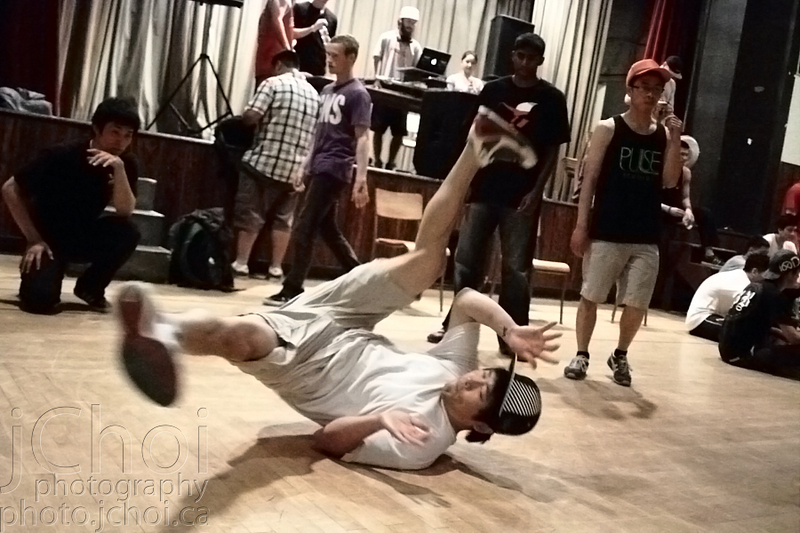 Okay, this was my first time at a Bboy Jam. I expected camera policy for no flash. I expected more room. 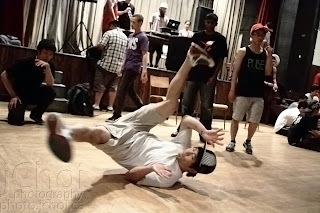 All wrong: there are no rules at a Bboy Jam. I should have brought a wider lens, because the crowd gets UP CLOSE to the dancers (like within hands reach). And people use flash. Flash would have definitely helped. The room was fairly dark, and I had to use ISO-12800 at 1/200s with the Olympus. Manual focus isn't a big deal since autofocus won't work in low light anyways. Even then I had to push process one more stop during post processing. There is significant loss of detail due to high iso noise. Hence, the poor image quality. Normally I would convert to black and white to walk around the noise issue, but not this time. I simply desaturated the images in post to reduce color noise. Labels: bboy jam vancouver vancity IBE qualifier 2011 "IBE qualifier" "IBE qualifier 2011" "filthee feet"